Trade is a much more complicated topic as the US cannot act unilaterally – the US punishes China and China will punish the US – etc. There are several significant policy changes proposed and planned by the Trump administration, and a few of them have potential significant ramifications for Industrials and Materials producers globally. The market has begun this journey generally bullish, but some initiatives, if pursued and if pursued quickly, could have both positive and negative impacts depending on who you are and what you make. In our view, and we do not pretend to be economists or political strategists, the Trump administration will look for a quick and relatively easy win, one which Congress will support and one which should get bi-partisan backing. There is not much on the Trump list that fits this bill, but a focus on tax reform as well as US infrastructure might be the one that works. Part of the tax reform might be a lower tax on repatriated cash as long as that cash was spent on US based capital investment. Few are going to question whether the country needs to improve its infrastructure – roads, bridges, passenger rail, ports etc. – but many will question how it gets paid for. Raising the national debt is one way – unpopular and likely to lead to inflation. PPP’s are the other – often very successful in terms of on-time construction and quality, but unpopular because the public must pay, through tolls or higher local taxes. Some combination of both is likely the most politically agreeable way forward. The country is seeing an increasing number of toll roads/toll lanes and the payment process has advanced materially from dropping coins in a bucket and slowing to zero to do it. Generally, people will pay to save time, and that may well be the way to think about funding road and bridge construction. 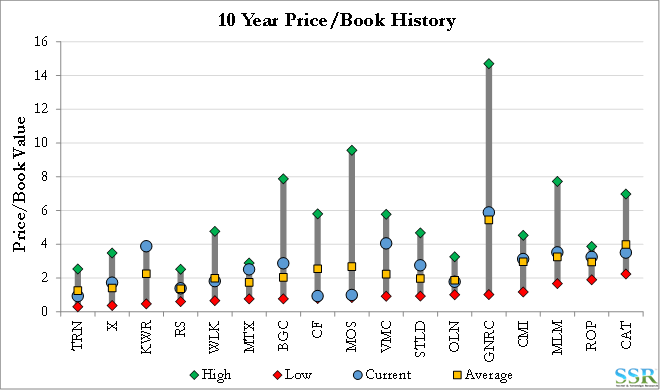 The obvious stocks are already moving quickly to reflect this idea – CAT, X, STLD, TRN, VMC, the E&C space. 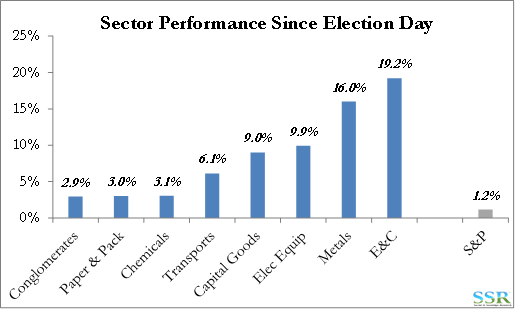 At a sector level, the moves so far are summarized in Exhibit 2 – every one outperforming the S&P 500. The initiative which has the greatest near-term concern for the group – especially the Chemicals space – is trade. Any attempt to limit imports or raise tariffs into the US to repatriate US jobs or make US manufacturing more competitive will have an immediate negative impact on US exports as trading partners retaliate. Note: this is not a straightforward idea from Trump and he will meet opposition on both sides of the aisle depending on the impact that any trade restrictions might have state by state. We are unconvinced that this will be a “first move” for the new administration. The US already exports $100 billion of plastics and general chemicals (see Appendix), and the current wave of US expansions is founded on two beliefs; one, that we have a feedstock cost advantage and two, that we can significantly increase this level of export over 5 years – mostly focused on plastics. 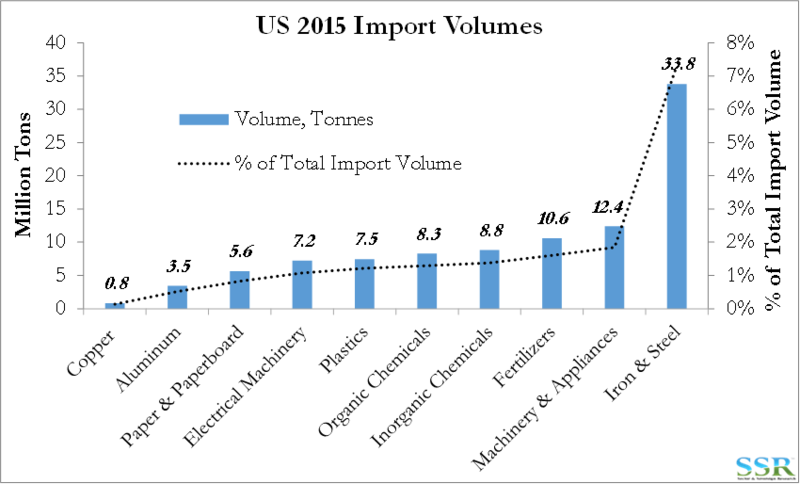 While the longer-term Trump goal is to repatriate manufacturing (currently exporting to the US) back to the US, which will raise US demand for these chemicals and plastics, it will not be enough to absorb the wave of new additions. Providing investment incentives for use of repatriated earnings might help here. There are some chemicals where the US is a net importer – here a protectionist policy would help domestic pricing and domestic producers – the obvious example today is urea – therefore CF and AGU, but polyester will also benefit, which at the margin might help EMN. There are others where the US is a large net exporter, but marginal imports are hurting US pricing – caustic soda and PTA for example. In these instances, we cannot model an outcome as while lower imports or higher priced imports might help the US market, a large export overhang would hurt. 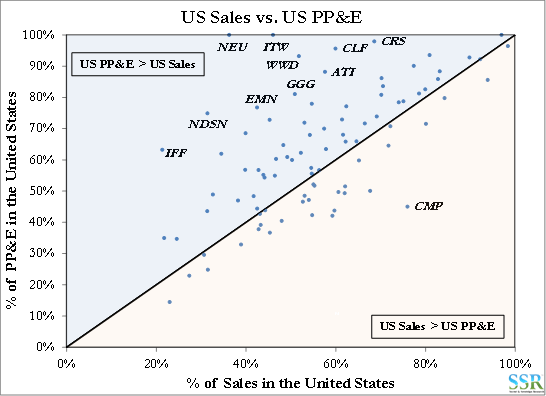 Both in Chemicals and in the broader sector there are companies much more reliant on exports than others. 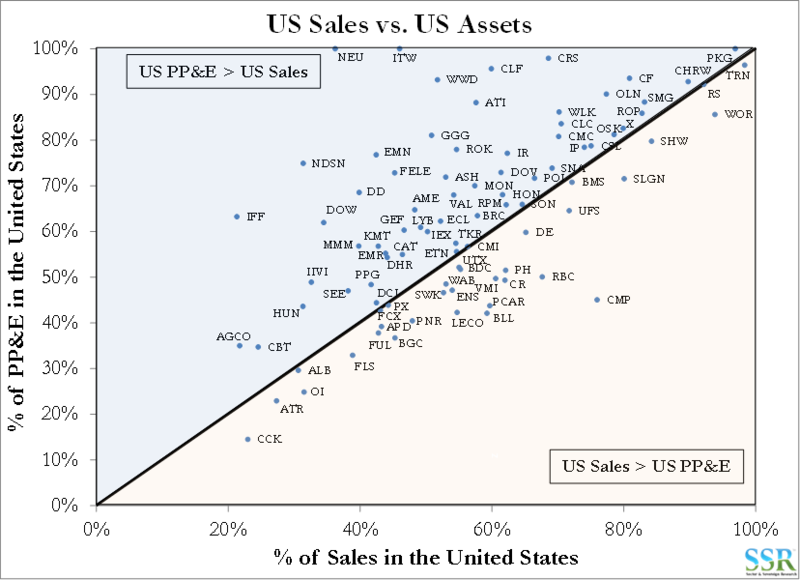 We tend to look at the relationship between share of revenues coming from overseas with share of assets overseas as a guide. For example, the industrial gas companies have very global businesses but manufacture everything locally, while by contrast, ITW and NEU have significant physical US exports. 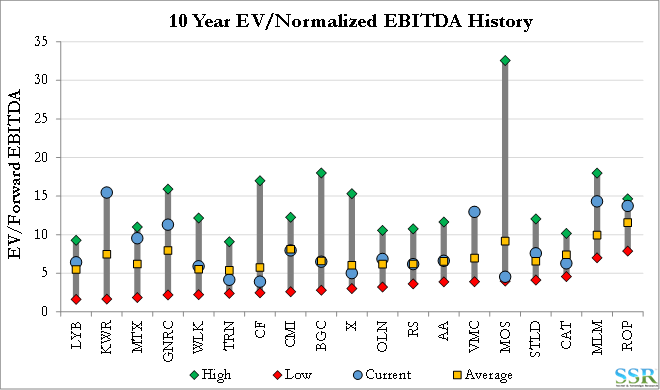 Forward EBITDA multiples confirm that some of the upside in these names has already been realized – Exhibit 5 – though on a normalized EBITDA or price/book basis – Exhibits 6 and 7 – there is considerable scope for further upside. 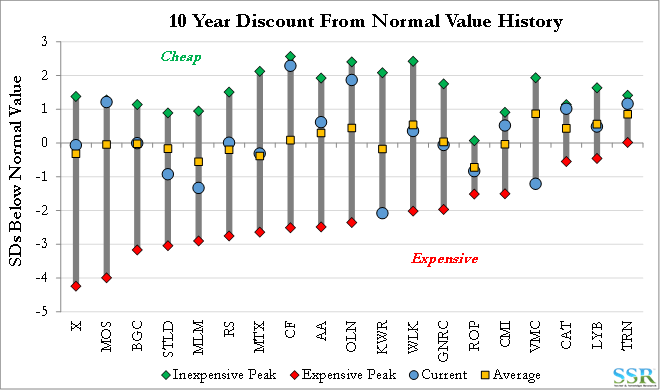 In Exhibit 8 we show the 10 year history of our return on capital based normal valuation models – CAT, TRN and the fertilizer companies look most interesting here. 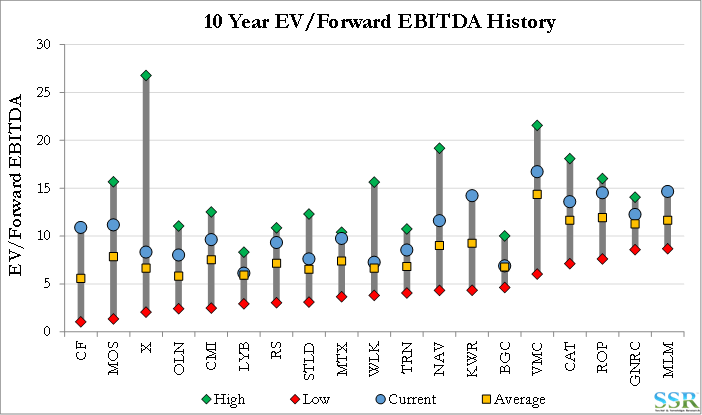 In Exhibit 9 we apply the same approach form the valuation charts above to gross margin history to see where operating leverage to demand upside could be most significant. 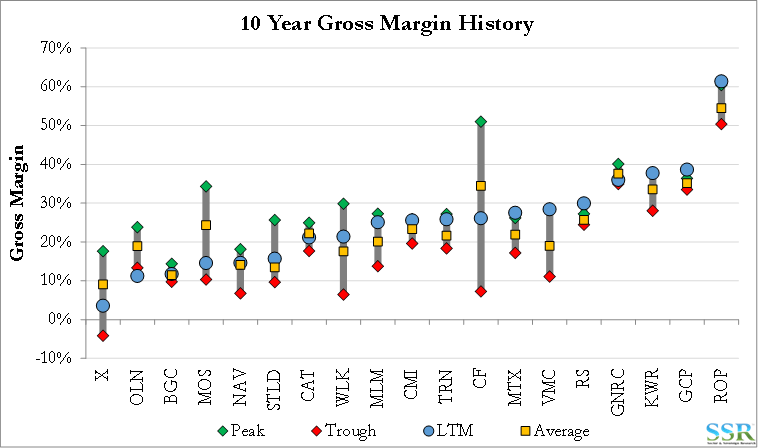 Generally speaking, the closer to peak margin the greater the profitability from incremental stimulus-related demand. 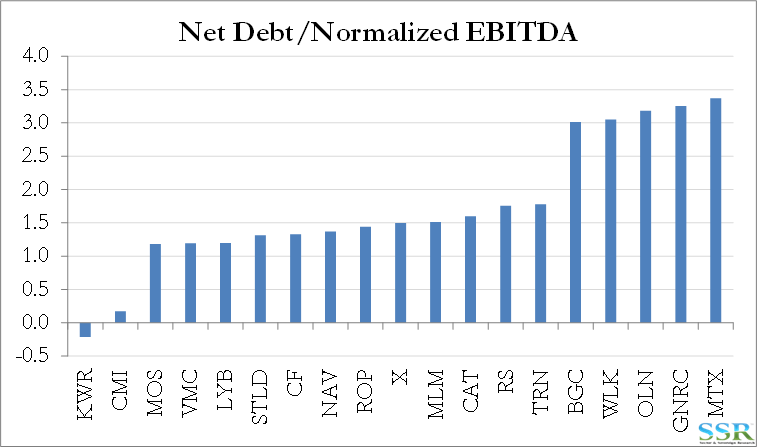 Exhibit 10 summarizes trailing net debt relative to normalized EBITDA as shown above. Combined with the pacing of debt maturities shown in Exhibit 11, only perhaps GNRC looks concerning.